At some point an adult ceases going to horror movies to be scared and simply accepts the ride as a gesture of showmanship. Our hope for the elaborate psychological exercise is replaced by a voyeurism for technical skill, and what once caused an emotional recoil becomes a sensational exhibit kept at arm’s length, however unconsciously. Those are not necessarily pessimistic observations about films themselves, but more about the desensitized nature of an aged mind; the attitude reflects a hardening of the soul brought on by greater horrors in the real world, where they undermine the more elaborate gimmicks of filmmakers seeking to penetrate the core of individual resistance. Consider this insight thoroughly when it comes to “It,” the new film adaptation Stephen King’s famous novel, and you may be surprised to discover a contradiction to that sentiment. Certainly our attendance may be dictated more by the neurosis of current horror trends than by mere nostalgia, but what occurs here is in the milieu of a long-forgotten attitude – namely, the idea that a menacing force lurking plausibly in the shadows can cause great harm to those ill-equipped to confront it. This is a film in complete isolation of the modern standard, passing beyond the conventions of aesthetic and fashion to exploit what is left of our deepest nightmares. What do those fears involve? The movie is not so much about specific ones as much as it is about where they fester: in this case, the most vulnerable spaces of childhood pain. Seven adolescent figures discover that culvert early on, having heard vague whispers of a terrible trend befalling the town’s children. One (Bill, played by Jaeden Lieberher) grasps that uncertainty more palpably than most; only months before his young brother Georgie (Jackson Robert Scott) disappeared in the middle of an evening rainstorm without a trace, and now the unknowing demeanors of others are intercut with a wonder that drives them to dangerous excursions. Then the rumors circulate that another young girl, also missing, was last seen playing in the sewer system near the river. They discover one of her shoes floating in the water. A villainous face – usually manifested as a clown with sinister gazes – stalks their periphery, reminding them vividly of personal traumas. As they are bonded by that commonality, they descend reluctantly into a supernatural labyrinth where a great evil attempts to devour them. But is that any different than the slow deaths they endure out in the open, where fearsome bullies and ambivalent parents only add to the anxiety of their existence? The movie takes its first notable plunge early on, well before a framework has settled. A young boy wanders out of a quiet home and into the rainy neighborhood streets, where an innocent chase ensues involving a paper sailboat. Inside the drain opening where it has fallen, an obscured monster emerges. He calls himself Pennywise, and attempts to make friends with the apprehensive boy. Suddenly a hand reaches out, leading to a climactic moment so horrifying that it can barely be fathomed – not to Georgie himself, and certainly not to the audience, who has yet to be prepared to deal with something that substantial. But things refuse to let up, even as the picture flash-forwards several months to the closing day of the school year, where a cluster of bullies led by Henry (Nicholas Hamilton) begin a torrent of terror on a group of students that is as mean-spirited as it is critical (one of the more shocking encounters involves Henry carving his initials into the stomach of another). The irony to some is that the presence of peer tormentors would satisfy any requirement for an antagonist; here, they are a conduit to rouse the victims into actions that will benefit them later, when much darker realities overtake them. 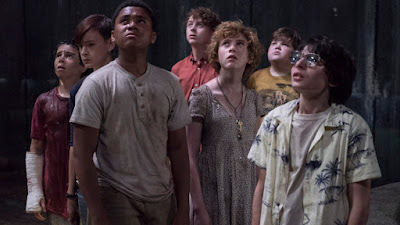 Those encounters also unite the children as proud outcasts, and they include Beverly (Sophia Lillis), a young girl known by others as the school whore (undeservingly so), and Ben (Jeremy Ray Taylor), the new kid in town, who is made fun of for his weight. There is also Mike (Chosen Jacobs), a home-schooled orphan whose routine consists of work at his uncle’s slaughterhouse, and when they come to each other’s defenses in the face of Henry’s violent harassment they discover other dubious commonalities: namely, a strange clown that has been haunting their waking lives. Most horror films would be eager to abandon their personal histories in favor of a stampede of terrible confrontations, but so is not the case with “It.” The script by Chase Palmer, Cary Fukunaga and Gary Dauberman remains surprisingly faithful to the material: it gives each of the primary personalities an opportunity to reveal themselves in isolated scenes, allowing us to understand their motives and their insecurities without them blending into a generalized synopsis of behaviors. Because we care about these teenagers, we also begin to identify with them. Their approaches go to the heart of youthful conviction, and we see them in various stages of realization, sadness, horror and even acceptance – they have realized at an early age that the world can be a horrible place, but the spark within refuses to be extinguished. King’s story depends persistently on this element, perhaps, because it contrasts the desires of the villain. The clown, often appearing in various guises, is a creature that feeds on the fears of his prey; without it, he seems little more than a powerless manipulator, eager to feed on the souls of the innocent as they subconsciously submit. Some may find his persistence redundant or even excessive, but the movie so thoroughly realizes the terror that we neither mind nor question. The performance by Bill Skarsgard, furthermore, is impeccable; what he does with his face and voice rival the growling horrors of Jack Torrance and early Freddy Krueger, and there is never a doubt that he is committed to the depiction. Many of the notable King novels are rooted in the menaces surrounding young characters, usually those who lead a routine with minimal (or even alienating) adult guidance. Director Andy Muschietti (who made the exciting “Mama”) depends on that arc to fuel the engine of his creativity, and here he is working with a screenplay that is perceptive, on-point and propelled by thoroughly dimensional exposition. None of the personalities are superfluous; they exist in unison with the vision of the story, to carry our sympathy through a stampede of horrifying situations and jump scares that threaten the well-being of an ensemble of likable young victims. By modern standards they are choreographed with a well-trained technical eye, sure, but they are so much more than just a triumph of technical exercise, too. That the movie kept me on edge for nearly its entire 135-minute running time is astonishing. That there is a genuine supernatural mythology at work underneath only adds to the value. That the kids who earn our trust are actual individuals, convincingly acted by newcomers who do more than recite dialogue or emphasize a shocked gesture, is a rare treat. And that the primary villain persists vehemently like a figure of wanton destruction is as unnerving as it is brilliant. So long have we been numbed by the conventional sense of this genre that it is almost remarkable to find oneself back in a state of vulnerability, oblivious of what is to come or how it might play out. A sequel is inevitable, I suspect, based on the open-endedness of the conclusion (not to mention the absence of half the story). The final act features an obligatory wrap-up for a variety of loose ends, but they don’t provide finality to many of the important questions, either. Where did this creature come from? Why does he only feed every 27 years? What will come of the survivors who still lack the understanding? Will their courage be enough to stop the events they have set in motion? For all its disturbing moments, packed together like a cluster of emotional explosions, “It” does not forget to keep us interested in answers. The movie is the embodiment of the classic standard of horror filmmaking, where the uncertainty works in unison with the vulgar visualization of terrible nightmares. And somewhere in all of this we almost forget that we are even watching a movie and find ourselves living the experience right along with the characters – a rare and precious opportunity in times that have undermined our visceral nature to be willingly frightened.